Perfect home in Yavapai Hills with stunning views, endless upgrades and tons of custom features. On the main level, there is a master bedroom and bath, 2 guest rooms, an office, living, kitchen, dining, separate breakfast nook and two balconies with wonderful views. Downstairs has 1 more bedroom and bath, media room, a second family room and extra storage. . As you enter the home, you are greeted with perfect wood floors and an open floor plan. Gourmet kitchen with soapstone counters, stylish cabinetry, large center island with butcher block counter, stainless steel appliances and a walk in pantry. All baths have custom furniture vanities and tasteful tile work throughout. 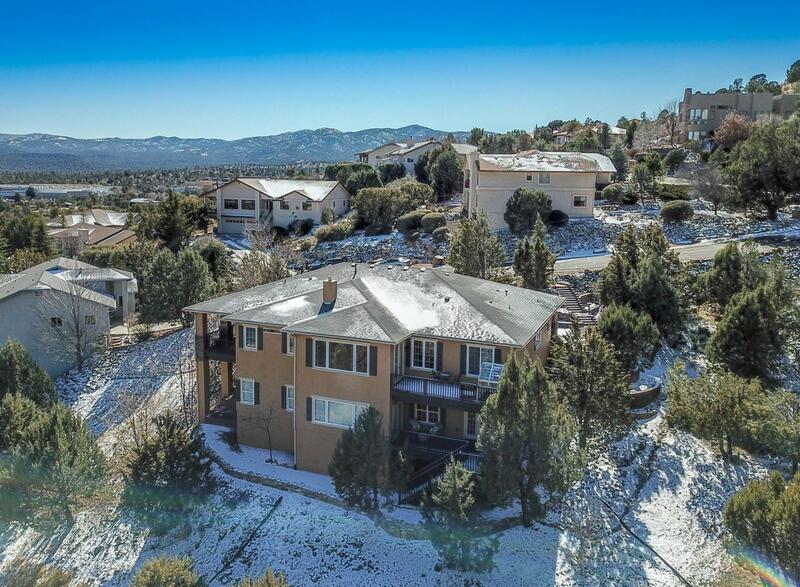 Crown molding and wainscoting add to the spectacular finishes.The home backs a naturally landscaped greenbelt with views from all 3 decks and the backyard that extend all the way to the mountains. Large master with separate jetted tub and shower, walk in closet and private covered deck that has a two person hot tub. Office with glass French doors, oversized laundry room, 2 additional bedrooms and 2 more baths located on the main floor. On the lower level, you will find a second family room, flex space and media room, another bedroom, bathroom, additional storage and another deck with wonderful views. The lower lever has endless potential for a dance studio, training/workout room, hobby or craft room, home theater/media room, wine cellar...you decide. And don't miss the 3 car garage, large front patio with great seating areas and the 1/2 acre lot that provides plenty of privacy. The house is well lit with in ground lights on the decks and walkway to the house. Full house sprinkler system. There are a few personal items that don't convey. The chandelier in the dining room. the lights over the island, the ceiling fans in the living room and the master bedroom and the drapes in the living room do not convey.